Red Dragon came to me as the Polar Vortex wobbled and split. This, my second dragon pattern, is inspired by the Chinese/Japanese dragon form, the first one I saw as a child, dancing in the streets of New York’s Chinatown. This is one of those - sinuous, wingless, airborne, dancing. This written pattern is for an experienced crocheter. While not difficult, it requires a lot of close and tight work in small spaces. There is a lot of slip stitching twice in the same chain and similar stitch stacking, stitch stuffing and stitch gathering to shape Red Dragon’s undulations and shapes. 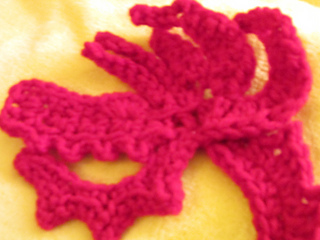 The pattern uses crochet’s ability to put the hook anywhere to realize various shapes within the form. 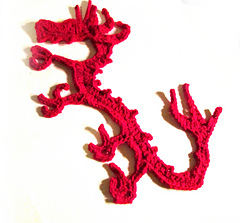 Using an aran weight acrylic and a G hook, the Dragons shown are about 20”/50.8 cm in length. You may use any yarn you choose, knowing that your size will be different.